Football fans of a certain age will fondly remember the Football Italia era of the 1990's, where the world's best players flocked to Serie A. Few players at that time were higher profile than Paul Gascogine - the stand out English talent who has almost led his nation to victory in the 1990 World Cup Finals. Gazza was signed by SS Lazio and was soon a hero with the Rome fans until his eventual departure for Glasgow Rangers. His stint in Italy helped put Serie A on the map in the UK and was the basis of Channel 4's coverage of the competition. 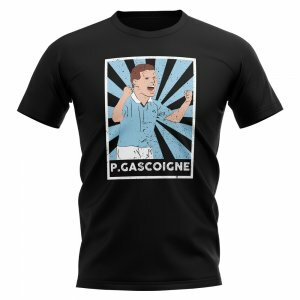 Pay tribute to Gascoigne with this distressed tee which is part of our legends series.